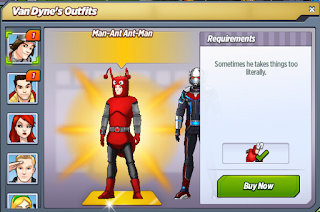 Man-Ant Ant-Man is an outfit that you can win for Ant-Man in the Spooktacular Halloween Crate at a cost of 95 Shards per try. After winning him, you'll just need to equip the outfit in Van Dyne's. 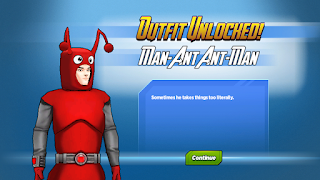 The outfit has a unique questline and allows Ant-Man to take part in Hangouts! Pirate Wasp: You're a real ant! Pirate Wasp: Dress for the job you want! 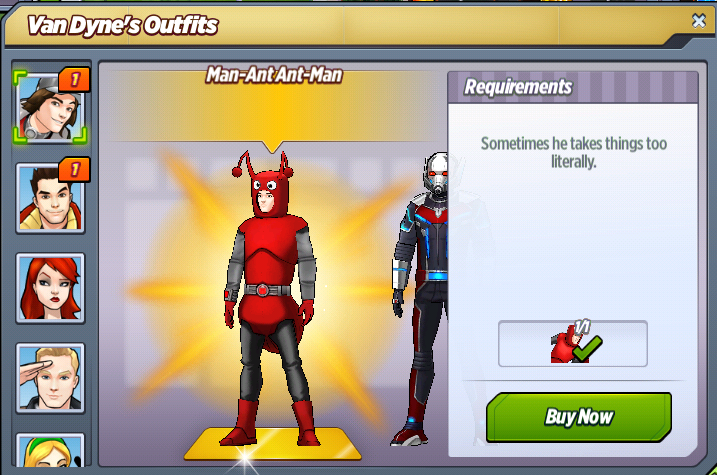 Man-Ant Ant-Man: I think this costume is confusing the ants. They tried to nominate me for queen. Pirate Wasp: I'll get my tiara! Thunder Loki: Are your boobly eyes and deely poppers a foolish attempt to impress your insect brethren? Man-Ant Ant-Man: They aren't that hard to impress. They're still talking about the time I gave 'em half a candy bar. Thunder Loki: We should overthrow their kingdom. Force the insects to do our bidding. Man-Ant Ant-Man: They're ants, man. What do you want them to do? Ruin Thor's picnic? Thunder Loki: You tried to trick me. Man-Ant Ant-Man: What are you talking about? Thunder Loki: You made your ant army seem feeble, but they actually have the ability to be quite destructive. They could help us uncover Fury's hidden power, and overthrow Midgard. Man-Ant Ant-Man: Not everyone wants to overthrow and rule everything. These guys are my friends. We help each other. Thunder Loki: I only understood each of those words as separate entities. Hank Pym: Amazing! The transformation is complete! 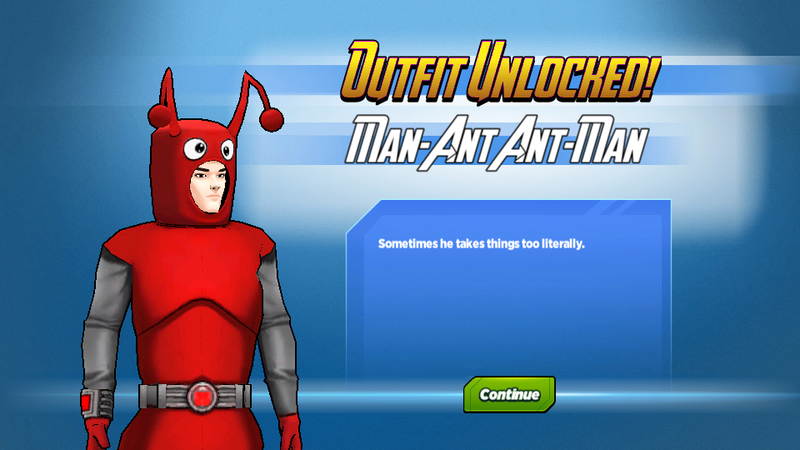 Man-Ant Ant-Man: It's a costume. It's not even remotely realistic. Why is this confusing to people? Hank Pym: Not the costume! I'm using Tony Stark's latest ocular X-ray tech to examine the Ant-Man helmet's effects on your brain tissue! Hank Pym: I have no idea! Man-Ant Ant-Man: Is that normal?! Man-Ant Ant-Man: What's the Ant-Man helmet doing to my brain? Hank Pym: It's nothing to be concerned about! Hank Pym: I wore it for years! What do you think of Man-Ant Ant-Man? Were you able to get him in time? Halloween Special Event: Episode 5! Halloween Special Event: Episode 4! Halloween Special Event: Episode 3! Halloween Special Event: Episode 2! Halloween Special Event is LIVE!